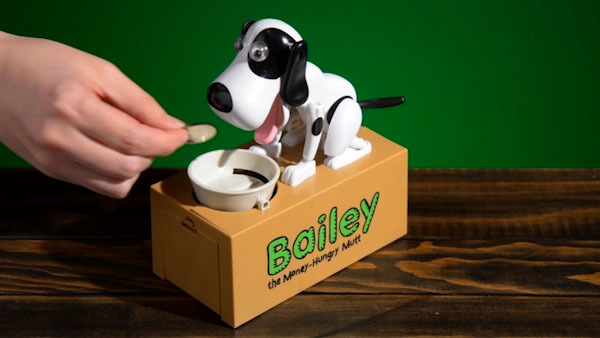 Bailey the Dog Bank: Animatronic Canine Coin Storage. Why simply drop a coin into a jar when you can watch your mechanical pet pooch lap-up your savings? 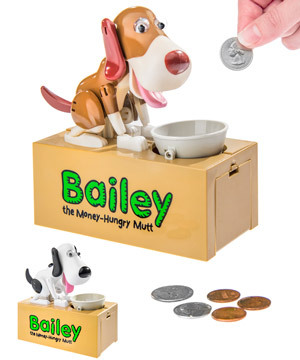 Bailey the Dog Bank is a fun way to teach young dog lovers the value of saving. Like his feline friend, this adorable pup can’t help himself when he sees his favorite food: delicious legal currency! 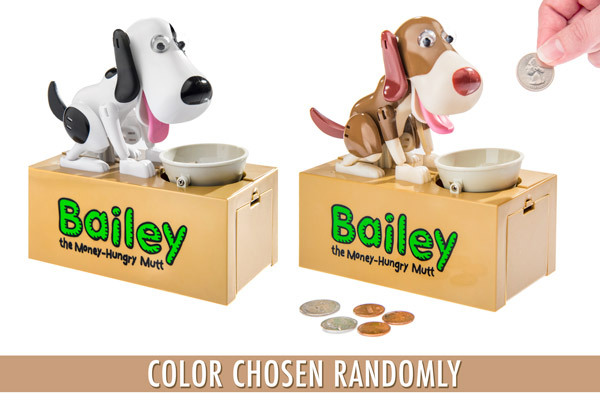 Place a coin in Bailey’s dish and watch him bend down to excitedly chow down your change. His head swivels, his body gyrates, and his tail happily wags as he licks his dish clean, knocking your coin into the storage bank below. The door on the side of the bank allows you to easily retrieve your money when you’re ready to convert your cash to bones. Because we receive this item in an assortment of designs, we must sell them randomly. You'll receive white/black or white/brown. Like most dogs, Bailey the Dog Bank doesn’t need training to learn how to eat. Bailey’s dish has a trigger in the middle and a slot at its base. Placing your coin in the dish presses down on the trigger and causes Bailey to leap into action. Watch as he goes from heel to hungry, moving his head back and forth as he happily wags his tail. During the feeding frenzy, the dish tilts downward and your coin falls through the slot, where it is deposited into the bank below. After feeding time finishes, Bailey returns to his sitting position where he eagerly awaits his next monetary meal. Pavlov coulda made some coin with this dog. Saving money, while responsible, is usually considered boring. But with an animatronic mutt to feed, your kids will love putting money in the bank. Seeing Bailey excitedly scarf down their coins is a great reward for making a responsible choice. When your child is ready to cash out their savings, the door on the side of the bank opens for easy access. Until then, they’ve got a faithful guard dog watching over their stash. Bailey will arrive with one of two different coats: black and white, or brown and white. Note: Due to the way we receive the product, the color you receive will be chosen randomly. However, after consulting the kennel club, we have determined that both are adorable. Best in Show is a tie. Question: Will Bailey eat anything or only U.S. coins? Answer: Bailey will eat anything that fits into the coin slot on his dish, which should accommodate almost any coin... and maybe a button or two. Question: Can he only eat one coin at a time? Answer: Bailey is able to scarf down multiple coins at once.